Recognizing the close relationship between these matters should put an end to posturing and give realism a chance! I wish also to draw attention to the negotiating paper adopted recently at Chequers by the British Government. It suggests establishing a regime of “enhanced equivalency” between the rules governing the EU and British Financial Services market. The proposed “enhancements” concern two main points: first to limit the ability of the EU to terminate the regime unilaterally on 30 days’ notice; secondly to subject the adoption of any new rules (they are initially identical) or amendments to them, to a bilateral negotiating procedure. From the EU’s point of view, it is clear that it is in the interest of economic activity to preserve the important advantages, including costs and competence, of an easy access to the City’s services. Conversely, the responsibilities of the Authorities in terms of “financial stability” for the Eurozone prohibits any form of sharing of sovereignty, concerning financial policy or regulation, with a third party. It is also worthy to note that nowhere in the British proposals can one find any reference to “equivalence” in the granting of rights to the EU over the UK financial markets and in particular over monetary policy. The latter can exert a major impact as a result of the existing intricate bilateral relations which are precisely the purpose of the current negotiations. It is highly unlikely that the British Government is prepared to confer to the Union an equivalent right of oversight of the UK financial market that it is demanding for itself over the Euromarkets! Unfortunately, this situation does not permit a compromise solution: if the Union wishes to develop a truly international accepted reserve currency, it cannot allow any limitation to its freedom of action. Let us illustrate this assertion by a concrete example: a classical “equivalence regime” such as exists between the EU, the United States and Japan could clearly be extended to the UK. Within this framework, perpetuating the City’s role in the clearing of Euros is perfectly conceivable as long as the UK abides by the rules (including with regard to the supervision of the actors concerned). Let us now imagine that at some point in the future, the EU wishes to enforce sanctions against a third party (like the US has done vis à vis Iran) and that the UK disagrees (like the EU with the USA) and continues to provide clearing services to companies disregarding the embargo. 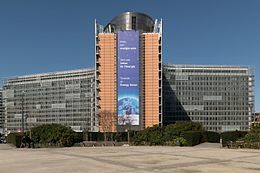 It stands to reason that the EU should be able to suspend unilaterally the extraterritorial clearing privileges concerning transactions denominated in €. The aim of gradually making the € a credible alternative to the USD can only be achieved if the Union has at its disposal all the tools used by the Americans who have transformed their currency into a “weapon of mass destruction”, as I have noted in previous writings. It is only under such circumstances that one could envisage, in due course, neutralising these arms, drawing a parallel with the cold war when the threat of total mutual destruction made the use of nuclear weapons unthinkable. The efforts (and sacrifices) that the EU must be ready to shoulder will be considerable, especially if they are increased by efforts in the field of defence, which, as pointed out by Pierre Defraigne, are necessary to ensure its strategic independence. Within such a context, there can be no question of sharing the slightest sliver of monetary sovereignty with a third party which, if granted, would totally undermine the EU’s credibility and ensure the long term submission of its Member States to the dictates of American policy. Whatever sympathy one might have towards the United Kingdom and the acknowledgment of its undeniable competencies in financial matters, the proposals of a meeting between the EU 27 and Mrs May next September to find a solution to the blockages cannot lead to concessions on the absolute independence of the EU concerning financial matters. It is high time to relegate to the dustbin the postures adopted by the negotiators which are based on irreconcilable logics, unless the parties have already recognized the likelihood of the UK’s withdrawal without a deal; the only remaining stakes would then become how to ensure that the other party took the blame. Such an outcome would be the hallmark of total irresponsibility by both parties, the losers being, once again the most fragile citizens and the winners, in addition to Vladimir Poutine, the national-populist parties who will be served on a platter, all the necessary arguments to lay the blame a the feet of the political parties responsible for this catastrophe!